Archer on Airguns: QB 57 Performance Review. Part 1 - Muzzle Velocity and Dieseling. QB 57 Performance Review. Part 1 - Muzzle Velocity and Dieseling. The QB57 is this interesting take down air rifle from China manufactured by the Shanghai Airgun Factory and sold by Archer Airguns. 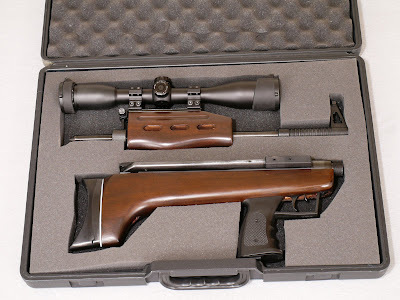 I like the QB57 a lot - it’s a fun gun to shoot, unusual-looking and is quite hold-tolerant for a spring air rifle. And although I am the first to agree that the finish and appearance of the QB57 is not among the best, it really shoots well. But how well? Overall, the QB57 significantly improves on the manufacturer’s specifications and performs very well for an air rifle in this price range. First things first. Please remember that “Gold Service” testing is performed with heavy, flat-nosed wadcutter pellets, so my results will clearly be slower than for the same gun shooting light, pointed pellets. Also, I’m always testing new guns. Some of these are “dry” from the factory, while others have their innards liberally coated in oil. (Don’t ask me why, that’s just the way they are). This is important as all spring air rifles that have oil in the compression chamber will tend to “Diesel”. Some of this oil will actually combust due to the pressure of the compressed air in the chamber - the result is increased, but erratic muzzle velocity. We will see the effects of Dieseling clearly in some of the results here. 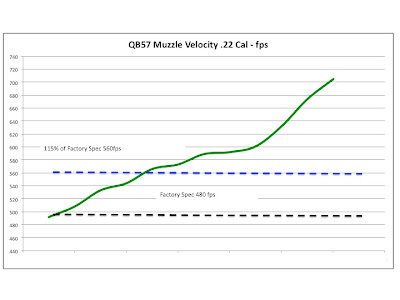 Muzzle velocity for the QB57 in .177 caliber is very close to the manufacturer’s claim of 650fps. “Gold Service” testing averages about 620fps - 95% of the manufacturer’s claims: it would probably equal the claimed muzzle velocity with light, pointed pellets. This graph shows the distribution of muzzle velocities actually recorded on test. The higher velocities - above about 660fps are real and clearly the result of Dieseling. QB57 muzzle velocity results in .22 caliber suggest that the manufacturers have under-specified this little gun with their claim of only 480fps. As you can see from the graph below, I have recorded muzzle velocities of 700fps on test with Dieseling guns. That’s around 15 ft/lbs of muzzle energy from this little gun. Wow!!! I would suggest a more realistic muzzle velocity specification in .22 to be about 560fps, that’s 15% above the manufacturer’s claims. Now this is really unusual - an air rifle that actually gives a muzzle velocity greater than is advertised! So how does Dieseling effect muzzle velocity consistency? Well, consistency is expressed mathematically as “Standard Deviation”. Basically, a low standard deviation figure is good - it means that the shots are all of a similar muzzle velocity. A high number indicates considerable inconsistency and is, therefore, bad. As we said, Dieseling effects all spring guns - not just the QB57. But the graph below clearly shows its impact. 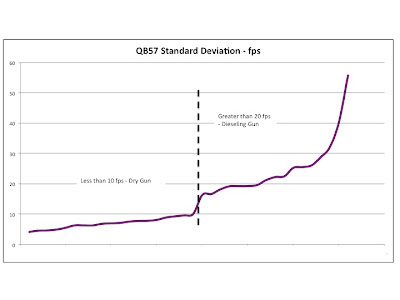 “Dry” QB57s have a standard deviation of below about 10 fps in “Gold Service” testing. Compare this to an average for QB78s of around 5 fps. Not bad at all. But it’s easy to see a sharp jump in the graph - suddenly standard deviations double and then triple very rapidly. This is Dieseling in action and it’s the guns with plenty of oil that do it. Dieseling declines as the oil burns off - any spring air rifle will dry out with time. 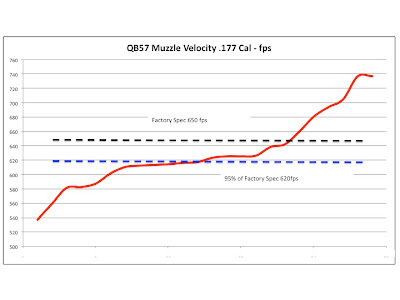 This leads to a conclusion that the average standard deviation for a “dry” QB57 is well below 10fps. Let’s say somewhere between 5 and 7 fps. This is very creditable for such a low cost spring air rifle. But wait, there’s more... and it will be published in Part 2 of this review. I have a QB57 and it's an awesome gun for plinking. At last an air rifle that shoots faster than the manufacturer claim. That test average for the .22 sounds much more like what I would expect. Stephen, what pellet weights do you use in your Gold Service testing? The .177 wadcutters average 8.6 Grains, the .22s average 13.86 Grains. So I use fairly heavy wadcutters for all Gold Service Testing.